Last year was a mixed year for OpenSim grids. 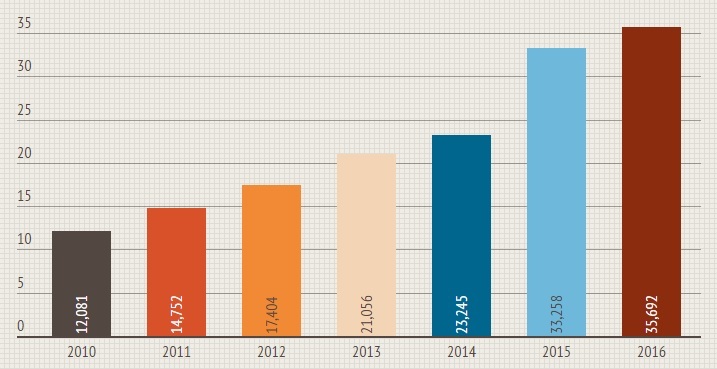 Active users were up, but the increase was much lower than in the previous year. The increase in registered users was also smaller, but this was mostly due to a multi-month outage on Avination, which is still down. Land area actually shrank this year, but most of that was due to a single grid shutting down a large unused land area. The total number of active users on the public OpenSim grids rose slightly from 33,258 to 35,692 at the end of 2016. That was a growth of 2,434 unique monthly active users, a substantial drop from 2015’s growth of 10,013 active users. For social grids, the biggest measure of success is the number of active users, both local residents and hypergrid visitors. The more active users there are on a grid, the more friends people can make, the more attendees event organizers can get, and the more customers go through in-world stores. And with hypergrid friends, groups and messaging functionality available almost universally, hypergrid visitors are starting to look and act more and more like locals. 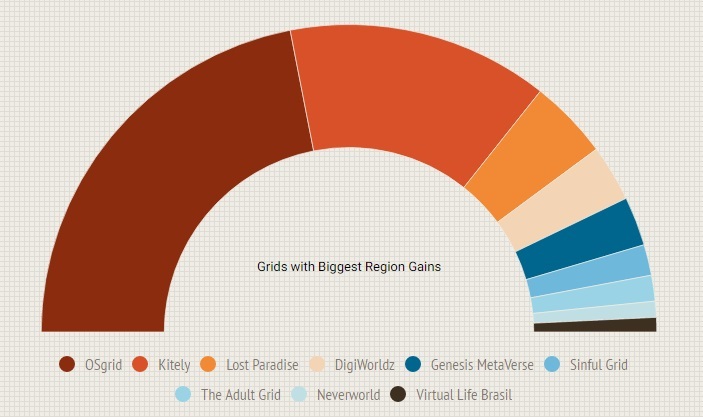 As a result, hypergrid-enabled grids continued to dominate the charts. Out of the top 25 most active grids, 22 were hypergrid-enabled at the end of 2016, up slightly from 21 at the end of 2015. I’m not including Israel-based Eureka World on this list, which gained 593 active users last year but is primarily an educational grid. It’s interesting to note that three of the top ten gainers — AllCity, Sinful, and Genesis Metaverse — all benefited from the implosion of AviWorlds as users fled to other grids. There have been questions raised about the AllCity stats, however, with the stats reporting page going down occasionally or not showing consistent numbers. According to grid owner Alexandre Rodrigues, there have been some problems with the API used to generate the data. However, there are a couple of indicators that the grid has, in fact, done very well this year. AllCity, which is a Brazilian social grid, did extremely well in our annual grid survey, where it scored best overall and also received top scores in the community, content and support categories. It also has a very active Facebook page, with event videos routinely getting hundreds of views. Registered users are an indicator of how many new users a grid is able to sign up, and a sign of successful marketing. At first glance, the numbers don’t show an impressive picture. OpenSim grids gained just 18,822 new registered users this year, down from 80,702 in 2015. However, Avination, one of OpenSim’s oldest grids, was down for server migration at the end of 2016. 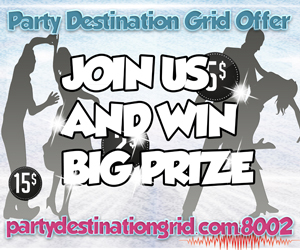 When it was last up, in June, the grid had 81,321 registered users, and 79,293 at the close of 2015. AviWorlds was also missing from the stats last month, again due to outages. But that grid only had 1,487 registered users at the end of last year, due to the fact that it has repeatedly gone out of business and started over from scratch. Excluding Avination and AviWorlds from the stats, the public OpenSim grids actually gained 99,002 registered users last year, which would have been a record high. 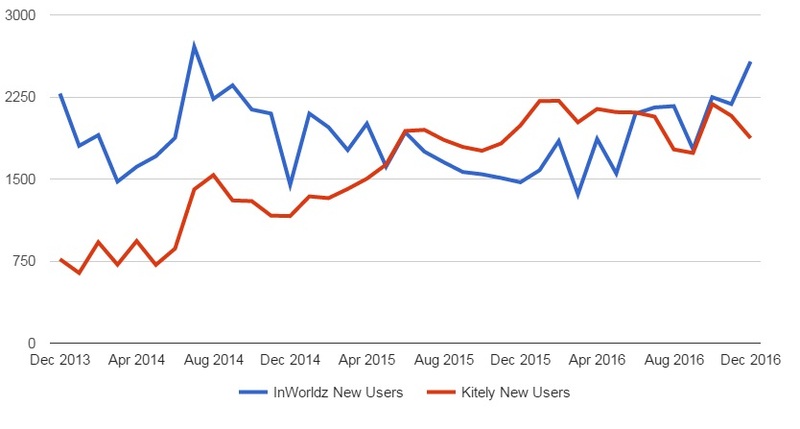 This is the first year that Kitely has registered more new users than InWorldz, though InWorldz seems to have reversed that trend this fall. Registered users don’t always translate to more active users since lack of support, high land prices, or lack of content may also drive users away. Total number of regions fell from 71,360 at the end of 2015 to 66,456 at the end of 2016, due to the absence of Avination and AviWorlds in the stats due to outages. But an even bigger land impact was that of Virtual World Grid, which had the equivalent of 19,754 regions at the end of 2015, and only 1,066 last month. Most of this land was unused scenic areas, but its sheer size made a dramatic impact on the total grid stats. “The last few distributions of OpenSim have been leaking memory like sieves so I have had to shut down the really huge varregions that I had running which when spun up equal another 20,000 regions,” owner Myron Curtis told Hypergrid Business. 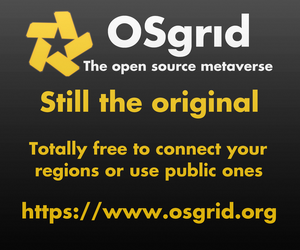 If those three grids are removed from the calculations, the total land area of all the other public OpenSim grids actually increased by the equivalent of 15,605 standard regions. I use the term “standard region” instead of just saying “region” because many grids now group their regions into variable-sized regions. When this happens, the grids are counted as just one region by the database. Some grids also offer the total number of computed regions, or standard region equivalents, or land area calculated in square kilometers or square meters, and that is the number I use since it more accurately reflects the total land area on the grid. We saw many grids fall off the charts in 2016. Some moved to other grids. They include Clutterfly World whose owner, Linda Kellie, is now on the Metropolis grid. Loff Virtual Worlds is now part of the DigiWorldz grid, as is Kea Nation. A total of 98 grids closed in 2016, including 2Worlds2Go, 3DHappiness, 4Addiktion Grid, 4Play, Aheilos, Auth, Avares, AvatarHaven, Avi Brasil, Avi Globe Grid, C4 OpenSimulator, CableGrid, Chaos Entertainment, CINECA GRID, CyberFace, Digital Enterprise Pathways, Draken Grid, Dream Forest, Eduland, Emerging Mind Project, Enoch, Fellowship, Flatlandia, Free World, Freedomland, Galaxylandia, GEA, Habitat7, Hiro’s PC, Home Stone Grid, HomeStoneGrid, Ingen-Lab, JJIE Virtual World, Jnix World, KOC World, Kohaku Grid, Kotori, KUNDGRID, Light Color Prim, Littlebird Grid, Loff Virtual Worlds, MajWorld, MathLife, MeetIn3D, Meridian Grid, Micachee 1, Mirage, Morpheusgrid, Mundo Virtual Brasil, Mystery, Neon Evolution, Nichtort, NurbsHouse, NZlandia, OpenSim.ru, Paradise World, PeerWorld, Pegasus, Pixel Planet, Planet Einstein, Pleasure Island, Pomroys World, Pseudospace, R5Academy, Radioactive Grid, Selea’s World, Serenity, Shadow of Your Mind, SimGrid, SimValley, Six Sides Grid, Snookums, Snow Matrix, SOlfaé, Superborea, TaylorWorld, Tertiary Grid, The Boggy Swamp, ThunderLife, Time Paradox, Traduverse, Tyland, Underground HipHop Connexion, United Kingdom, University of Cincinnati OpenSim Virtual Campus Grid, University of the Aegean, Utherworldz, VALENCIA_UVEG_LAND, VCER, Virtual Beach Party, Virtual College of The Siskiyous, Virtual Designers World, Virtual Dream, Virtual Hispano, Virtual Life, Windring, XTR-13, Yugen World. Many were only up briefly and barely an impact on the community. Some, however, had more than 100 active users this year, including Virtual Dream, Avi Brasil, SimValley, CyberFace, Virtual Life, Genesis, Eduland, MathLife, Avares, and JJIE Virtual World. But 55 new grids have been born this year, including Activity Ds, AllCity, Alterworld Grid, Américas Worlds, Arrival Nation, Ascension Grid, Atlantis, AU Metaverse, Bartelbe, Binary Hills, Binders World, Calypso 3D, CyberNexus VW Grid, Digital Multiverse, Discovery Grid, Emilac, Encore Escape, EVA Park, Genesis MetaVerse, Greenworld, HD Skin World, Hypergrid Life, Icelady Grid, JadeyLand, Kaz Grid, KoolPheller Estates, Kroatan Grid, Moonglow, Moonlight Grid, My Virtual 3D Life, One More Grid, OpenSim Life, OpenSim UAb, Osirus, OwiGrid, PaderGrid, Poqpoq, Regno Di Camlaan, Second Chance, Second World, Sector 17, Servex Grid, Sinful Grid, TeCoLa, Tenebris Mysterium, Terra Virtua, The Public World, Trans Sidera, Unreal, Ventureworldz, Virtual ABDL Grid, Virtual Final World, Virtual Life EU, Watcher’s World, and Yaras Welt.